Does anyone else sometimes hate the Facebook On This Day? For me it should be a good thing because it shows how far I have come in my weight loss journey. Don’t get me wrong I don’t need to lose any more weight I just need to tone up, huge difference. But when I look at them my stupid brain just thinks what did 00Steve see in me, was I really that fat and no one told me? However I was recovering from an eating disorder, I kinda always will be I think it’s something that needs your brain to snap out of. So if someone today told me I needed to lose weight I think I would have slid back down that slippery slope. Here’s one of them…5 years apart. 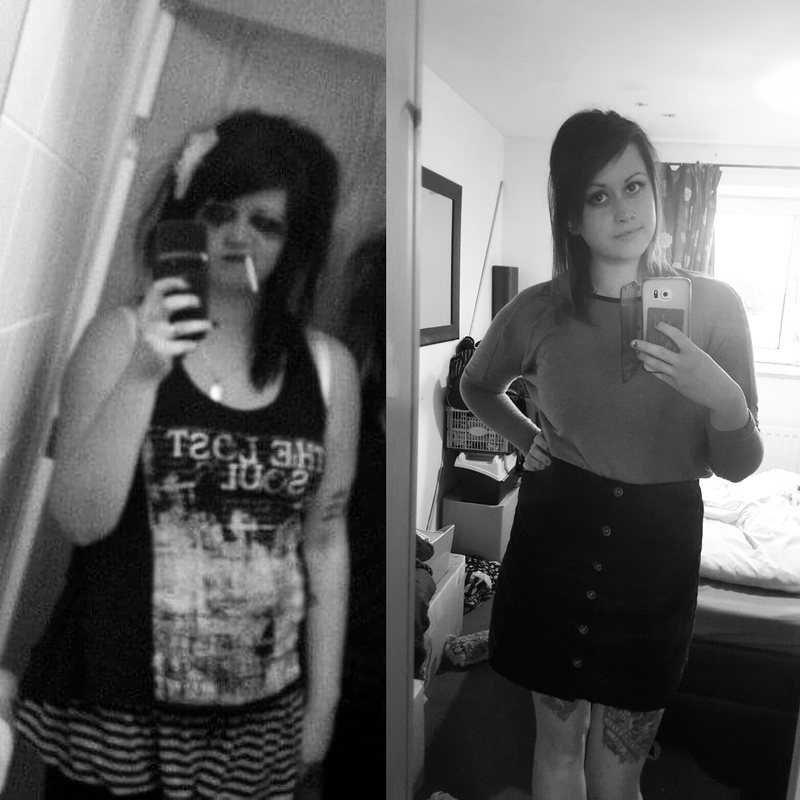 On the left I was going to see Black Veil Brides it wasn’t a standard day to day make up and hair look! The right was what I wore minus a cardigan to a family tea party for Ra-Ra. It’s absolutely staggering and really caught me off guard, I got married at that weight. I hate all the photos of me from my wedding too. I had lost a stone before that, I knew I was big but not that big. How 00Steve found me attractive I don’t know. Don’t get me wrong I know it’s all how you perceive yourself, I am actually only a stone lighter now but I lost the weight properly and in doing so my body adjusted correctly. Having my stoma has somehow managed to improve my body confidence even though unless I have it out you wouldn’t be able to tell I even have one. I wrote a post on how I usually view myself here, days like today are becoming few and far between. None of us regardless of age or gender or whatever should be made to feel like we are any less than perfect because each and everyone of us are. It’s society that is the ugly one and it’s society that needs to change not us. “None of us regardless of age or gender or whatever should be made to feel like we are any less than perfect because each and everyone of us are. It’s society that is the ugly one and it’s society that needs to change not us.” YES! Love this blog post!